You can never have too many books about friendship. The good times. The hard times. The breakups. The makeups. 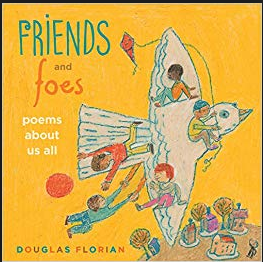 Douglas Florian's FRIENDS AND FOES: POEMS ALL ABOUT US is another winner. 25 poems about friends. Rhyming poems. List poems. A couple of poems in two voices. Illustrated with folk-ish art. A lovely addition to your friendship basket. Or your Florian basket. You have to let it grow. You really cannot rush it. Tara is hosting the Poetry Friday at Going to Walden. I love these poems, Carol - and, yes, the best friendships have deep roots, they have to in order to survive all that happens in friendships over time. Thanks for the friendship poems, Carol. My best friends are moving to Florida and the first one is just right for the group photo card I am making. I am a fan of Douglas Florian’s work. Thank you for these. I fangirl over Douglas Florian. I have so many of his books on my bookshelf, and I look forward to adding this one. for giving / forgiving ❤️ Friendship blooms are beautiful. Douglas Florian is a master!! Lovely book by Douglas Florian Carol, thanks for sharing it with us! I'm a fan of his too and took a peek at this newer book–looks delightful. Oh, I do love these. And, I'm collecting poems for a special project at school. So, these are perfect! Thank you. These are great friendship poems. Thanks for sharing them.